On November 4, 2008, I remember leaving my office at BET to head to Q-Tip’s election night party. On my way out the door, I had a sense of pride knowing that so much effort was put in by the hip hop community to ensure that we’d finally see the first black President of the United States. 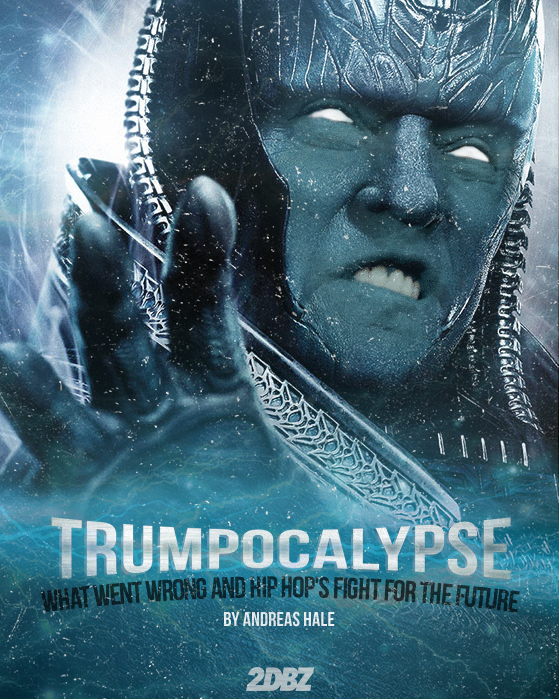 You simply couldn’t escape from hip hop’s presence during the election. Before you liken that to the fact it was for a Black president, while true, mobilization efforts were strong in 2000, when Al Gore was infamously robbed of a seat in the Oval Office by George W. Bush. But the momentum was building and eventually led to Barack Obama becoming the 44th President of the United States in 2008. How things have drastically changed. On November 8, 2016, I remember feeling overly confident that America would finally see its first woman president. Not because Hillary Clinton deserved it, because she was actually a pretty bad candidate. But because Donald Trump was so egregiously wrong for the job. Not only did he lack experience, but he evoked the worst traits an individual could have. The misogyny, racism and xenophobia he displayed were everything wrong with America. However, what was assumed to be a landslide victory for Hillary Clinton ended up being the equivalent of the Cleveland Cavs roaring back from a 3-1 hole to upset the Golden State Warriors. The aftermath has been one of revolt out of frustration. How could this happen? More importantly, what could we have done differently? Specifically, what could the hip hop community have done, if anything? Hughley’s words are a sad reminder that we haven’t come as far as we thought we have. Blackness is still considered seasonal and hip hop culture does not rule America. As a matter of fact, if the outrage of Beyonce’s performance at the Country Music Awards is any indication, America still has a problem with “us.” And “us” includes the people who sympathize with our struggle. There were a lot of mitigating factors that went into Trump’s presidential victory. From the silent majority (read: rural white America) turning out in droves to “take their country back” to Hilary Clinton being a pretty awful candidate in terms of connecting with an audience and likability. But there was a glaring void this year and that had to do with the mobilization of the hip hop community. When it came to election night coverage, MTV and BET were nowhere to be found with celebrities expressing how important it was to vote. TVOne was the only network with ties to the urban community that had programming dedicated to the presidential election. But even they had to go off the air in favor of Sanford & Son reruns. As the nightmare of Trump winning unfolded, I began to get this sinking feeling that we were lulled into a false sense of complacency. And it’s a weird complacency because movements such as #BlackLivesMatter have been front and center. But that had less to do with the presidential election and more due to the civil unrest in the community when it pertains to the police. Meanwhile, there has been a bump in minority presence on TV and Film over the past eight years that Obama has been in office. Progressively black music has performed well with the masses from J. Cole’s 2014 Forest Hills Drive to Kendrick Lamar’s To Pimp A Butterfly. It felt almost unfathomable that a diabolical campaign run by a Republican nominee endorsed by the KKK could prove to be successful. But that’s exactly what happened right under our noses. But perhaps we were so busy turning our angst to excellence that the most obvious of things slipped through the cracks. Hell, a majority of the country was too busy to recognize that Trump had a chance. Nobody in their right mind thought that Trump could actually win. But he pulled it out while we fell asleep at the wheel. It’s not the hip hop community’s fault by any stretch of the imagination, but it’s certainly a wake up call that we have to do better. Yes, even better than before. We have to fight as hard to defend the White House from inexperienced misogynists and hate mongers just as much as we needed to fight to get our first black president. Mobilization efforts dropped because we were complacent. Hip Hop, as much as it has been more active in response to social injustice, had lost it’s edge politically. We tend to forget that there is a distinct correlation between what happens in the streets and what happens at the polls. We spoke out on #BlackLivesMatter but need to put just as much energy in voting to ensure that laws such as “Stand Your Ground” don’t exist to work against us. You can laugh at Lil Wayne being an idiot in his Nightline interview but then you have to be reminded that he’s not the only person who thinks this way. We’re still a society who believes that being rich makes the world color blind. That’s simply not the case. As much as Lil Wayne didn’t want to admit it, police will probably kill someone who looks like him. And you can’t really wear your wealth when your skin color is what comes first. To think that if it is not directly affecting you, it isn’t a problem is pure ignorance because, when you least expect it, the isms will come knocking down your door. And Trump’s victory is proof that. It’s fascinating when you look at the percentage of Americans that voted over the past two decades. 50.3% of the population turned out to vote in 2000, 55.7% in 2004, 57.1% in 2008 and 54.9% in 2012. But in 2016, that number dipped to 46.9%, the lowest turnout in the history of this country. Obviously, these numbers aren’t indicative of the hip hop community not turning up at the polls. But, ultimately, more could have been done to ensure that we made it out to the polls and played defense like the 1985 Bears to ensure not only that Trump wouldn’t move into The White House, but that both the House and Senate wouldn’t be under Republican control. The fallout has seen protests rage across the country while countless acts of hate have been carried out against minorities, the LBGTQ community, women and others. It’s vitriolic and divisive as the country is being split in half. We’re finding out that the more we think things change, the more they stay the same. You couldn’t have sold the idea that half of this country would get behind Donald Trump’s hate spewing rhetoric. And to be clear, the problem doesn’t lie with Trump, but with the droves of people who found kinship in his message. Here’s the reality: As much as we thought that change had been evoked in the community, the opposite has happened. The angry right has come out swinging to make their presence felt, take back “their country” and make America great again. Our perception of cultural assimilation was laid to waste in one fell swoop and the reality that we’re not all in the same gang reared its ugly head. We, as a country, fell asleep at the wheel while Trump motivated the silent majority to vote without a hit single. What we have to do now is be just as vigilant in our efforts as we were when Bush was in office. This country isn’t changing. Instead, the scum of the country have been motivated to do what they’ve always done. And now we have to be motivated to fight back. What lies ahead is unknown. But we have to be prepared. Do not let these protests be the last they hear from us. Hip Hop can be a political force if we so choose to use it as one. This is far from over, the Trumpocalypse will hopefully awaken a beast.